Why doesn't the head board square up with the planks that make up the wall behind it. the piece of wood that makes up the top of the headboard is WAY out of angle with the edges of the planks ( which I would assume are fairly straight, they match the vertical line of the table leg. I don't even see a 'corner' of where the walls meet. And if you follow the plank edges on through the headboard it looks even stranger. And where is the SHADOW of the headboard ? On the vertical piece of wood closest to the wall I see light shining on one side of it, but no corresponding shadow on the wall. After years of looking at copies of this photo it 'Just don't look right'. The headboard looks propped up. Its not attached to the back of the bed. The mattress is just resting on planks on a base. Yes, it doesn't look right at all, does it? All the angles are wrong for the bed to to be against the back wall. It looks like a flat wall behind the side of the bed to me so it could be that the bed was a few feet away from the back wall in the photo. 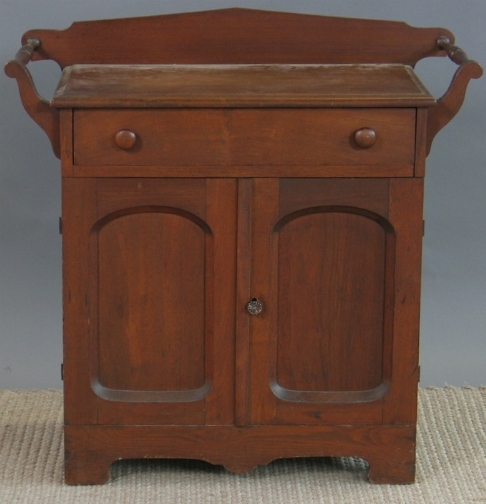 Also I believe, as I said before, there was the disused washstand on the right side of the bed, like the one shown below, so the bed didn't sit directly against that wall either. Last edited by ChrisGeorge; 03-06-2009, 10:59 PM. Sorry, I don't understand that, Chris. Where is the 'break' in the wall? 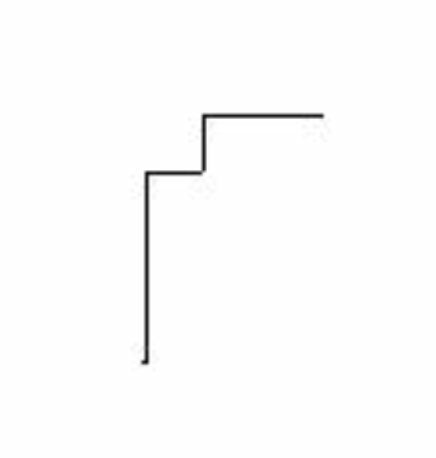 In fact, what is a 'break' in a wall? I think there are two features in the Kelly picture which may serve to explain what is happening. It really all depends on the position of the bed in the room when the pic was taken and the angle at which the camera was placed. I think the explanation is that the bed, at the point when the photo was taken, was not hard up against the alleyway wall of Room 13 but had been pulled out away from that wall. Where is the table ? An interesting graphic, Chris. Can you integrate the table into it ? And what about the headboard shadow ? With the light strong enough to shine on the headboard pole on one side, shouldn't there be a shadow on the wall somewhere ? Thanx to all for the quick responses ! The illustration in Reynolds' News (I think it was - don't have it to hand) shows the disused washstand behind the headboard, occupying the space between it and the wall. This explains why the head of the bed wasn't flush against the wall - the washstand was "pushing" it towards the middle of the room. As Chris George just suggested, Marys bed may not have been flush to the wall on the right side, so that bedroll may be in a place where it is kept during the day. If the space was constant, why not tuck it away to prevent staining and wear. It may be a quilted blanket of some kind, maybe hand stitched so easily worn when people sat or lay on it a lot. That would lead one to surmise she hadnt made the bed for sleep yet,....which may be true,....but a lot of booze and an hour off and on to sing might make a young woman flop back onto her pillow and pass out without doing so. I woke up last night at 3am in my chair1/2, with my glasses on, and a book open in my lap. I had a bottle of Beaujolais with my dinner. Thanks Stephen. You can just see part of the washstand (behind the headboard) at the right edge of the drawing. This is the newspaper sketch that I referred to earlier that shows the disused washstand to the side of the bed, next to the partition. 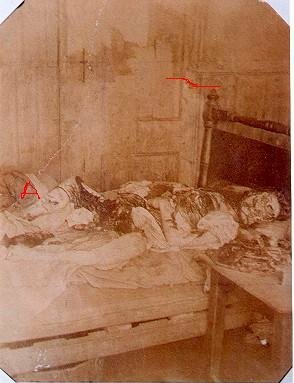 It was, I believe, the washstand that the bolster referred to was sitting on that is seen on the far side of the bed in the large MJK photograph, at "A" below, which also illustrates the break in the wall that I believe was there, as discussed in my earlier post. Thanks, Chris - I can't recall seeing that little gem before. That said, the sketch shows a rather natty table in the middle of the room, some intact chairs, and no bedside table. In addition, there appears to be a rather stout candle (complete with a "Wee Willie Winkie" style candle-holder!) and a ginger beer bottle conveniently placed on the mantelpiece. 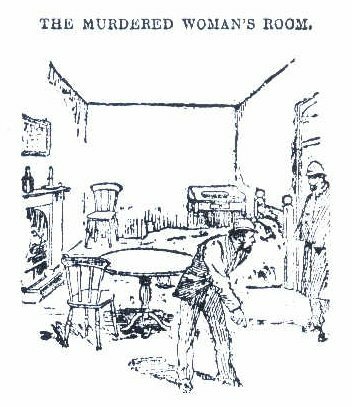 Added to which, the detective is pointing to a presumably clue-free patch of flooring. This suggests to me that the artist made a lot of the scene up, for illustrative purposes (in the broadest sense). Last edited by Sam Flynn; 03-10-2009, 11:01 PM. Take absolutely no notice of the bearded man with the invisible golf club. A November Police illustrated news illustration also shows the washstand in exactly the same position as the Reynold's sketch too, behind the headboard, although I guess one sketch could have been copied from the other.